Science Citation Index Expanded, Journal Citation Reports/Science Edition and Current Contents – Engineering, Computing and Technology, Scopus. Ad Hoc & Sensor Wireless Networks seeks to provide an opportunity for researchers from computer science, engineering and mathematical backgrounds to disseminate and exchange knowledge in the rapidly emerging field of ad hoc and sensor wireless networks. It will comprehensively cover physical, data-link, network and transport layers, as well as application, security, simulation and power management issues in sensor, local area, satellite, vehicular, personal, and mobile ad hoc networks. The main focus of the journal is to publish original contributions, including regular papers, short papers, research notes and communications, review and survey papers. In order to provide timely dissemination of ideas whose evaluation may require significant time and impose publication delays, one of the unique features of this journal is to allow authors the publication of promising concepts and algorithms with either partial or without prior experimental evaluation. performance evaluation, modeling and simulation. 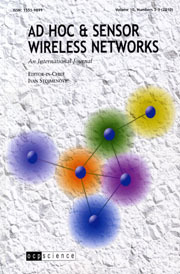 The editors of Ad Hoc & Sensor Wireless Networks invite your contributions.